Held in Las Vegas, Nevada, every January, the annual consumer electronics show CES is where we get a sneak peek at the latest tech gadgets we’ll be buying in the next few years, and a glimpse into the future of technology. Over its 50 years, CES has traditionally focused on “black box tech” (televisions, home entertainment, and gaming devices), but the emergence of the smart home has brought a lot more color to the Las Vegas Convention Center—and this year was the year of the stylish smart home. Innovations had technology at their core, but style was front and center in products such as LG’s OLED R rollable television, La Metric’s mosaic light panels, and Emteck’s smart door locks. Read on for 10 of the gadgets and inventions that caught our eye at CES 2019. Say goodbye to that bulky smart door lock and hello to some style and sophistication in the smart home. 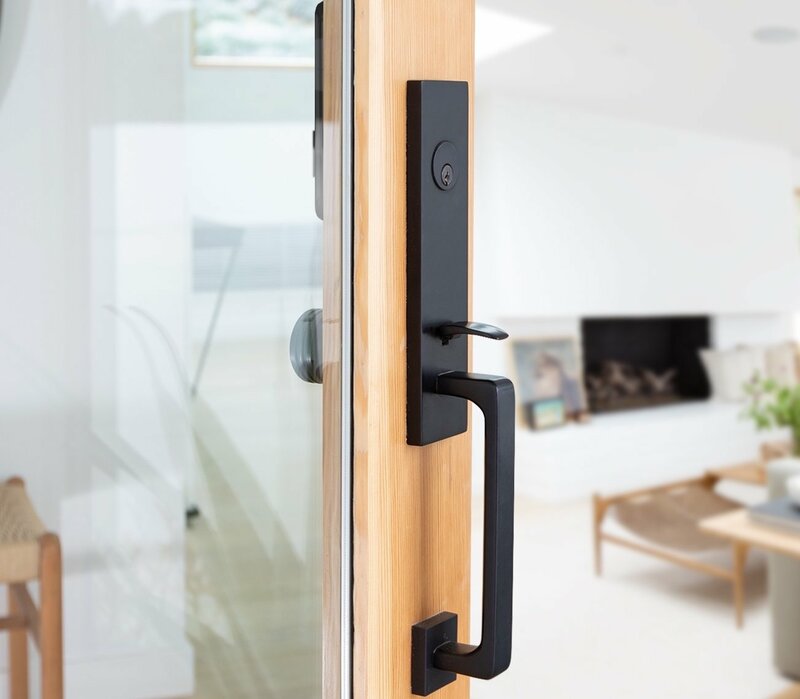 Custom door hardware manufacturer Emtek launched its first ever line of smart locks at CES: the EMPowered Smart Locks—Connected by August. Now, when you choose your door hardware style, you can add a touchscreen keypad or a keyed entry set powered by Emtek’s sister brand, August. The smarts include automatic locking and unlocking as you approach or leave, remote access to your door lock, the ability to send digital keys and to know if the door has been left open, plus voice control through your voice assistant of choice. The keypad will be available in February, and the keyed entry set in April, starting at $350. Offering an entirely new form-factor for a television, this 64″ rollable, OLED screen finally allows for freedom of design in your space without the traditional limitations of a wall and a fixed black box. Place your TV in front of a window, in the middle of a room, or anywhere you like—because it will disappear into its base when not in use. 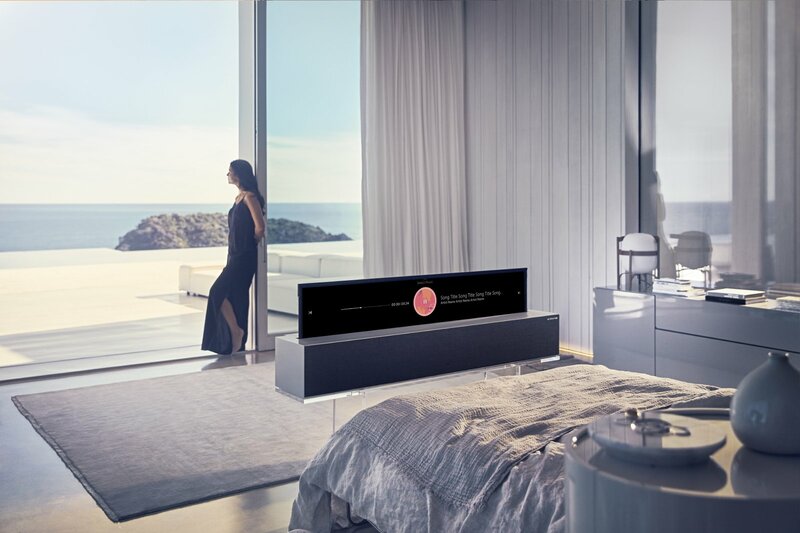 That base is also a Dolby Atoms 4.2 sound bar, with an aluminum body and wood blend cover (produced by Danish textile company Kvadrat), so not only does it look good without the TV, it also works as a bluetooth speaker. Available in the second half of 2019; no pricing has been announced. LaMetric brought some color to the Eureka Park section of CES with its new Sky mosaic light panels. 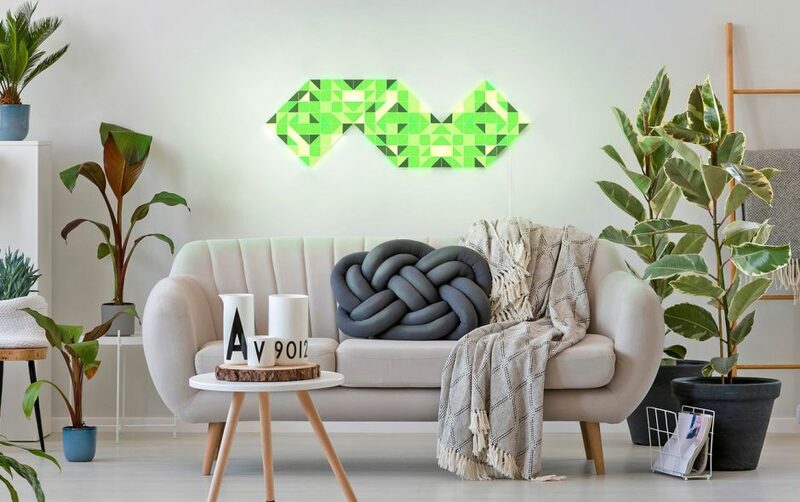 Designed “for mood and motivation,” these follow in the footsteps of NanoLeafand other innovative smart lighting designs. 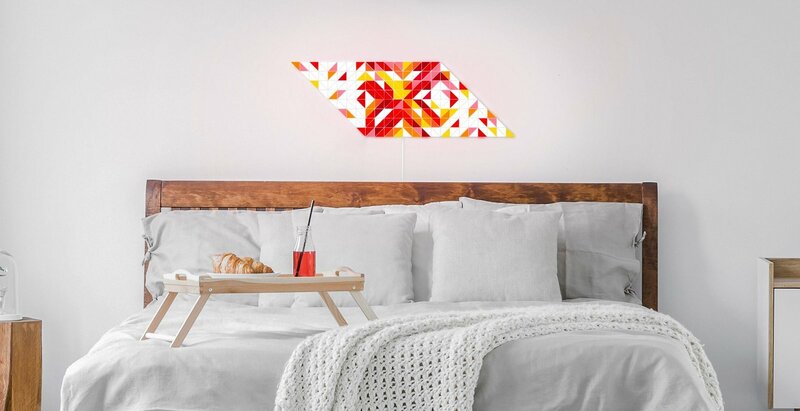 Comprised of right triangular LED panels you stick on your wall, each set contains 32 individual triangles of light that will each put out its own color. This type of precision gives a lot of versatility in your light display, allowing for words, figures, and any (reconfigurable) design you want. Smart home integration let you control the lights with your voice, set scenes, and display the temperature from a Nest thermostat, air quality and humidity from a Netatmo Weather Station, or the name of the song playing on your Sonos. Smart lighting for your home’s exterior emerged at CES, and as always, some of the prettiest products came from Philips Hue. The company showed off its new range of connected, colored landscape lighting—including the Hue Econic wall light (pictured). 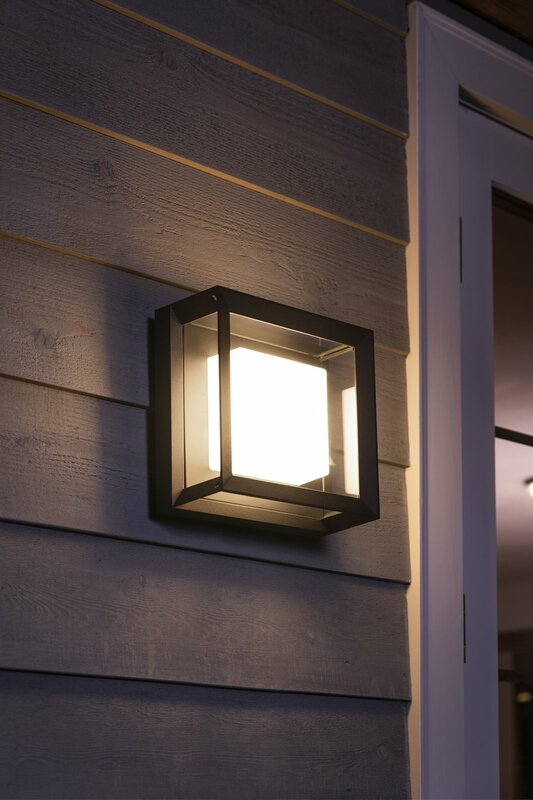 Alongside being able to choose from 16 million colors and all shades of white, these LED lantern fixtures boast smart capabilities, meaning you need never arrive home in the dark. Completely controllable and customizable from the Philips Hue app, they also integrate with home automation systems such as Apple’s HomeKit and Amazon’s Alexa, giving you voice control and other connected features. Most fun however, will be the ability to decorate your home’s exterior in different colors and dynamic light sequences for every season and holiday. The Philips Hue Outdoor Lighting range is available now; the Econic range is available in March. When it comes to real technological innovations, we don’t often see brilliant design right off the bat. But Heatworks is breaking that mold. Employing its proprietary Ohmic Array technology, Heatworks heats water instantly without heating elements, instead using the natural conductivity of water and electricity. 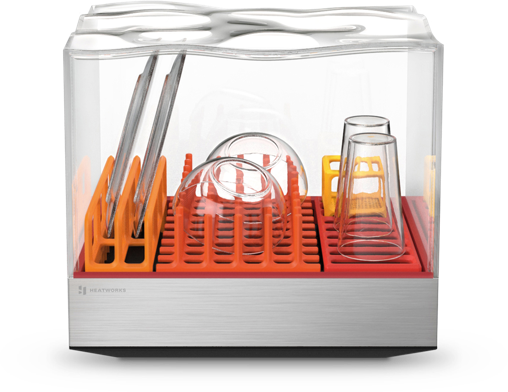 Last year they showed off the tech at CES in the Tetra, a countertop dishwasher designed by frog that simply plugs in—no plumbing needed. A CES 2019 Best of Innovation Award Honoree, Tetra will be available for pre-order later this year starting at $399. This year, Heatworks also debuted the DUO Carafe—a battery-operated hot water carafe that filters and heats water instantly as you pour. The ultimate bedside coffee maker. 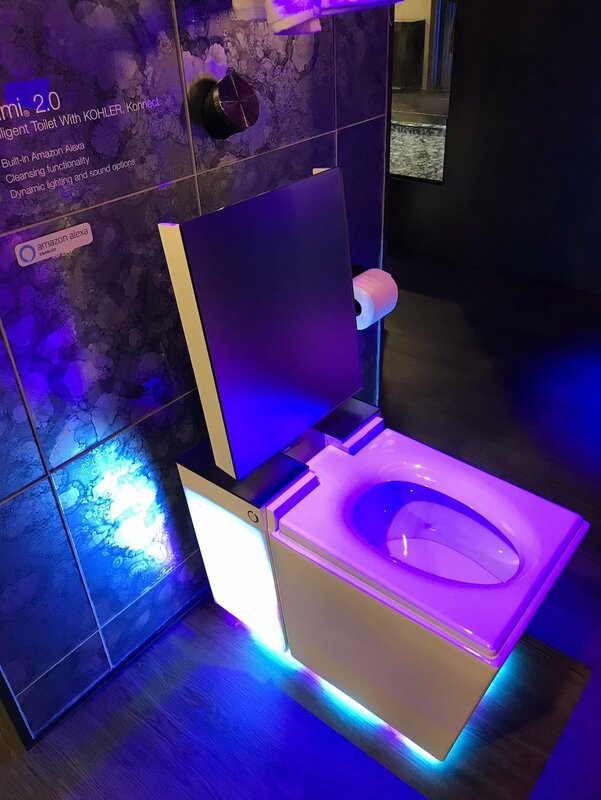 High-tech toilets aren’t new—Kohler, Toto, and others have been integrating seat warmers, touch-less flush, bidet functions, and auto open/close into their high-end models for a year or so now—but Kholer’s Numi 2.0 comes with Alexa built-in, so now your toilet can talk to you. While it’s not going to give you any cheek about your bathroom habits (hopefully! ), a voice assistant in your toilet does make sense, according to the Kohler rep we spoke with at the show. At $8,000, that’s an expensive convenience, but add in the dynamic, immersive lighting in four scenes (Forest, Sunrise, Miami, and Bokeh), and the striking contemporary design with a glass lid, and you’ve got quite the bathroom experience right here. Numi 2.0 will be available at the end of 2019 for $8,000. It’s here. It’s finally (almost) here. The fabled cordless hairdryer. 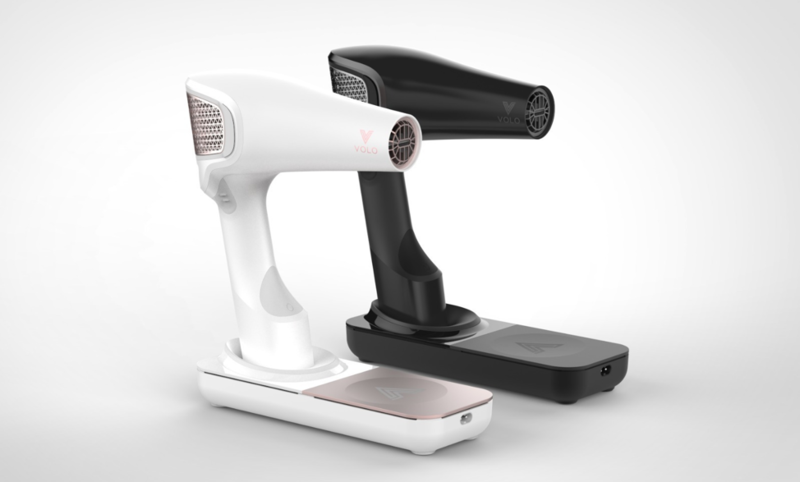 No more twisting around your hairdryer’s cord to get the perfect do—Volo Go is a cordless dryer that promises about 14 minutes of battery life, and to dry your hair in half the time of a regular corded appliance. Its quartz infrared light and heat technology penetrate the cortex of your hair, drying it from the inside out—resulting in a healthier dry, according the company. Powered by a lithium-ion battery, Volo Go will certainly free your bathroom from cord clutter, but we got to try one out on the show floor and it’s a lot heavier than a regular dryer. Although that could mean you can skip the arm workouts at the gym. Volo Go is due for release this summer with a retail price of around $400. It wouldn’t be CES without robots, and while most on display at CES are still years away from mass production, one fully functional robot we saw this year is the FoldiMate. 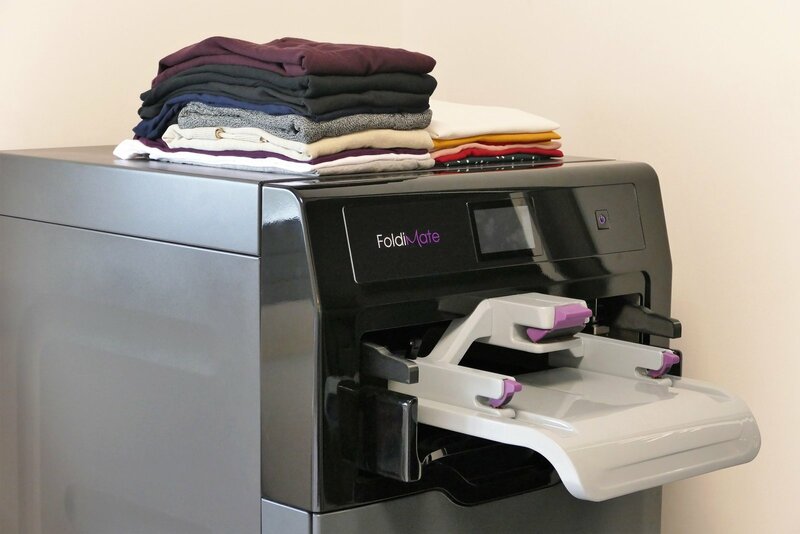 This Rosie the Robot precursor will fold an entire laundry load in under five minutes. Just place the clothes on the panel individually and they come out the bottom in a nice, neat stack. FolidMate will be available later this year at an estimated price of $980. Speaking of conveniences, how about never having to worry about your beer fridge being empty? That’s the idea behind DrinkShift, a fridge that keeps track of your beer and drinking pace, then delivers your favorite beverage to you at the perfect time. With storage for beer at the bottom and a showcase to display glassware at the top, DrinkShift doesn’t look like your average beer fridge or kegerator; it has some actual style. DrinkShift is scheduled for release this year; no pricing has been announced. Outdoor company The North Face teamed up with BMW Designworks to debut its futuristic fabric FutureLight. Billed as “the world’s most advanced breathable-waterproof outerwear technology,” FutureLight promises to bring real breathability to waterproof material through a nanospinning process that creates nano-sized holes. 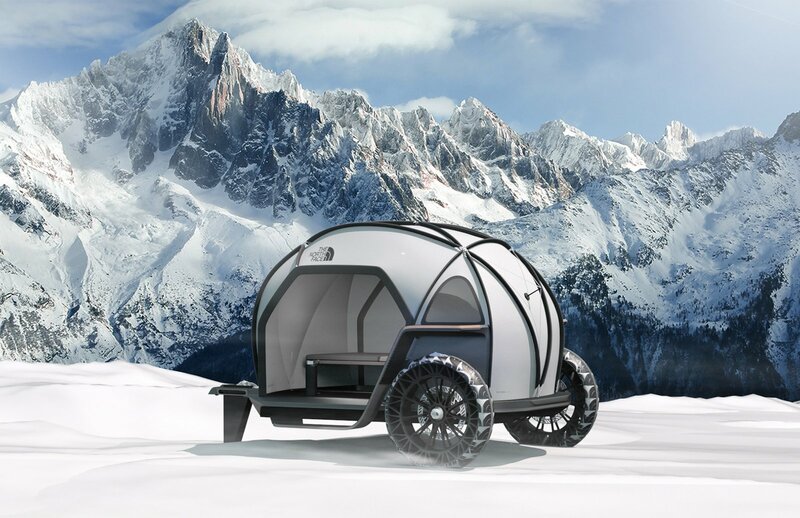 To show off its capabilities at CES, BMW Designworks built a lightweight camper with the flexible material stretched over a geodesic dome, demonstrating the potential uses of the fabric beyond just apparel. Sadly, the camper is unlikely to become a reality, but the fabric will be available in The North Face Fall 2019 product line.